Because our knowledge of the mind's afflictions remains so limited, psychologists  even when writing in academic publications  still deploy metaphors to understand difficult disorders. And possibly the most difficult of all to fathom  and thus one of the most creatively named  is the mysterious-sounding borderline personality disorder (BPD). University of Washington psychologist Marsha Linehan, one of the world's leading experts on BPD, describes it this way: "Borderline individuals are the psychological equivalent of third-degree-burn patients. They simply have, so to speak, no emotional skin. Even the slightest touch or movement can create immense suffering." Borderlines are the patients psychologists fear most. As many as 75% hurt themselves, and approximately 10% commit suicide  an extraordinarily high suicide rate (by comparison, the suicide rate for mood disorders is about 6%). Borderline patients seem to have no internal governor; they are capable of deep love and profound rage almost simultaneously. They are powerfully connected to the people close to them and terrified by the possibility of losing them  yet attack those people so unexpectedly that they often ensure the very abandonment they fear. When they want to hold, they claw instead. 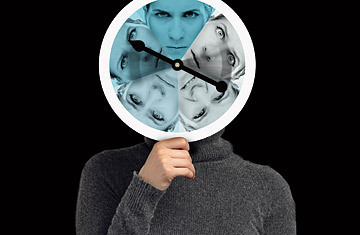 Many therapists have no clue how to treat borderlines. And yet diagnosis of the condition appears to be on the rise. A 2008 study of nearly 35,000 adults in the Journal of Clinical Psychiatry found that 5.9%  which would translate into 18 million Americans  had been given a BPD diagnosis. As recently as 2000, the American Psychiatric Association believed that only 2% had BPD. (In contrast, clinicians diagnose bipolar disorder and schizophrenia in about 1% of the population.) BPD has long been regarded as an illness disproportionately affecting women, but the latest research shows no difference in prevalence rates for men and women. Regardless of gender, people in their 20s are at higher risk for BPD than those older or younger. What defines borderline personality disorder  and makes it so explosive  is the sufferers' inability to calibrate their feelings and behavior. When faced with an event that makes them depressed or angry, they often become inconsolable or enraged. Such problems may be exacerbated by impulsive behaviors: overeating or substance abuse; suicide attempts; intentional self-injury. (The methods of self-harm that borderlines choose can be gruesomely creative. One psychologist told me of a woman who used fingernail clippers to pull off slivers of her skin." See five truths about health care in America.